With Russia facing sanctions from the US and some other countries after it annexed Crimea from Ukraine, India on Wednesday made it clear that it will not support any “unilateral measures” against Russian government. “India has never supported unilateral sanctions against any country e.g. Iraq or Iran. Therefore, we will also not support any unilateral measures by a country or a group of countries,” government sources were quoted by Press Trust of India in New Delhi on Wednesday. 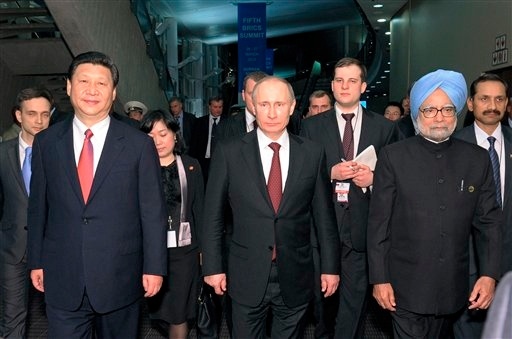 The remarks came a day after Russian President Vladimir Putin explained the situation to Prime Minister Manmohan Singh who underlined India’s position on “unity and territorial integrity” of countries and hoped a diplomatic solution would be found to the issue. The US and the EU have imposed sanctions on several officials from Russia and Ukraine accused of involvement in Moscow’s actions in the Black Sea peninsula. Australia has also announced its decision to impose financial and travel sanctions on a dozen political figures from the region. “(Crimea) republic residents made their democratic choice in line with the international law and the UN charter, which Russia accepts and respects,” said a Russian Foreign Ministry statement on Wednesday. Putin signed the treaty last night with the Russian- backed leaders of Crimea, pressing ahead with an annexation that Washington and Ukraine’s new government say is illegal and unacceptable.